NAIROBI (Reuters) - Burundi has banned the BBC and indefinitely suspended Voice of America, moves that campaigners and the international broadcasters described as a blow to press freedom. The central African nation's media regulator revoked the BBC's licence and accused it of airing a documentary that it said was false and damaged the country's reputation. It extended an existing suspension on VOA, accusing it of employing a reporter who opposed the government. Both broadcasters were suspended, initially for six months, in May last year in the run-up to a referendum that opposition politicians and activists said was designed to extend the president's rule for at least a decade. At the time it accused both of breaching press laws and unprofessional conduct. They have been off air in Burundi ever since. "The unwarranted decision of the Burundi government to ban the BBC and suspend indefinitely Voice of America strikes a serious blow against media freedom, and we strongly condemn it," the BBC said in a statement. The publicly funded British broadcaster aired a documentary last year about what it said were secret detention and torture sites in Burundi. The government dismissed the report and the BBC said it stood by its journalism. Burundi's regulator on Friday also banned journalists from working for either organisation. "We are alarmed that reporters in Burundi are now forbidden to communicate with VOA and believe these continuing threats to our journalists undermine press freedom in the country," VOA Director Amanda Bennett said. 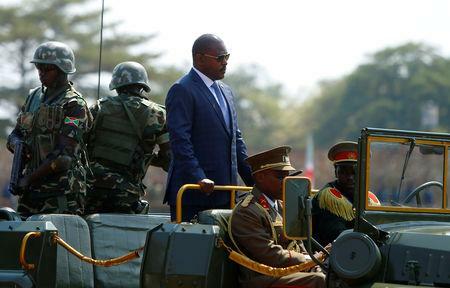 Hundreds of Burundians have been killed in clashes with security forces and half a million have fled abroad since President Pierre Nkurunziza announced in 2015 he would run for a third term in what his opponents saw as a breach of the constitution. He won re-election. Last May's referendum overwhelmingly approved changes that could let the president stay in power to 2034 - though the opposition rejected the results and the United States said the process had been marred by voter intimidation. Burundi ranks 159th out of 180 countries on the World Press Freedom Index 2018, compiled by the advocacy group Reporters Without Borders. Burundi has denied that there are widespread restrictions.